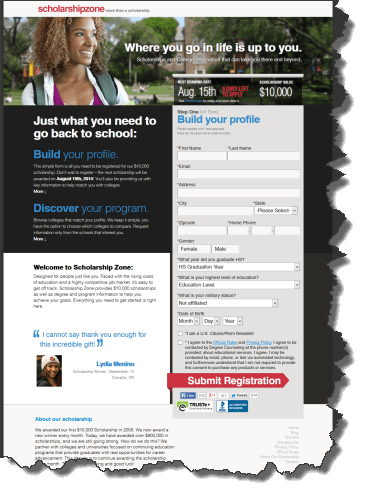 A company called the Scholarship Zone offers monthly $ 10,000 in college scholarships for continuing education. They claim to have awarded their first $10,000 Scholarship in 2005. And have continued to award them every month since. This adds to $800,000 in scholarships, so far. While the origin of the funds are not explained in detail, apparently they have been doing it every month for more than 9 years now. The website asks potential candidates to fill an online form that creates a profile and it does asks about your citizenship status. If you feel that it could be beneficial for you, we suggest you check their website for further information.